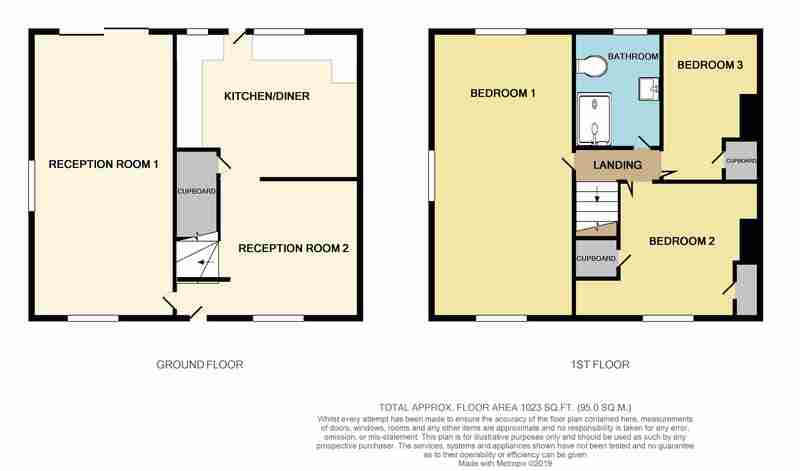 PROPERTY DESCRIPTION Occupying a wide plot with terrific scope for development at the side and rear, subject to usual planning consents, this three bedroom semi-detached home enjoys bright and spacious accommodation, set in a popular and mature non-estate location. Gas centrally heated throughout the layout currently offers a living room, dining room, kitchen/breakfast room, three bedrooms and first floor bathroom. Enjoying an extensive frontage with own driveway and detached garage and a generous rear garden, the property is situated adjacent to the well regarded J.M.I. school. Stanstead Abbotts High Street is within comfortable walking distance together with St. Margaret's main-line station serving London Liverpool Street. ENTRANCE LOBBY Doors off to living room and dining room. LIVING ROOM 22' 2" x 11' 2" (6.764m x 3.412m) Being triple aspect, a bright and spacious room with Upvc double glazed windows to front and side and sliding patio doors to the rear opening onto the garden. Two radiators. Coved cornice. DINING ROOM 11' 8" x 10' 0" (3.577m x 3.055m) Upvc double glazed window to front aspect. Wall mounted gas fire. Picture rail. Radiator. Low level recessed storage cupboard. KITCHEN/BREAKFAST ROOM 14' 5 max" x 11' 6" (4.39m x 3.526m) Fitted with a range of wall and base units with work surfaces over. Tiled splash-backs. Inset one and a half bowl enamel sink and drainer. Built-in electric oven/grill with four ring gas hob over. Extractor canopy. Space and plumbing for automatic washing machine. Space for fridge and freezer. Wall mounted 'Worcester' gas fired boiler. Deep under stairs storage cupboard. Two Upvc double glazed windows to rear aspect and door opening to garden. FIRST FLOOR Split level landing. Loft access hatch. BEDROOM ONE 22' 2" x 11' 2" (6.757m x 3.416m) Currently running the full depth of the house, this room could easily be sub-divided to provide two bedrooms or a master incorporating an en-suite/dressing room if so required. Upvc triple aspect windows to front rear and side. Two radiators. Coved cornice. BEDROOM TWO 11' 7 max" x 9' 11" (3.53m x 3.031m) Plus recess. Upvc double glazed window to front aspect. Built-in wardrobe cupboard. Built-in recessed storage cupboards. Radiator. BEDROOM THREE 11' 7" x 8' 0" (3.550m x 2.439m) Upvc double glazed window to rear aspect. Radiator. SHOWER ROOM Fitted with a modern suite comprising: Large shower cubicle with shower attachment and 'rain-fall' shower head and glazed screen. Low level w.c. Pedestal wash hand basin with mixer tap. Chrome heated towel rail. Fully tiled walls. Upvc obscured double glazed window to rear. EXTERIOR The property enjoys a wide frontage which is walled with pedestrian and vehicular wrought iron gates. Driveway provides access to the garage. GARAGE 20' 10" x 11' 4" (6.370m x 3.459m) With up and over door to front and personal door to the rear opening to the garden. REAR GARDEN Generous rear garden with patio to the immediate rear of the house and further paved area behind the garage and under cover storage area. The remainder of the garden has lawn areas with vegetable plots with a timber garden shed and green house to remain. There is also a useful outside timber, rendered outhouse with a w.c. Gated side access. MORTGAGE ADVICE MORTGAGE ADVICE Through our mortgage broker EDD RANFORD of Mortgage & Money Management Ltd, we are able to offer INDEPENDENT mortgage advice, with NO OBLIGATION. Edd is also independent for all protection needs, allowing him to review your life assurance and critical illness policies to ensure you have the best deal! He can be contacted at our STANSTEAD ABBOTTS office on 01920 412600. Please feel free to call him for any advice or quotations required. Oliver Minton Estate Agents Ltd. Registered in England & Wales. Company No: 06475871.